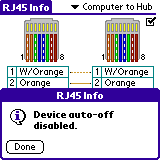 The idea is based on RJ45 by Palmary Solutions, but it works on the TX and you can disable the auto-off for as long as you are inside the application (use the checkbox on the top-right). 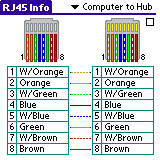 This application is not the similarly named 'RJ45' and it works perfectly fine on the TX. To disable the device's auto-off, tick the checkbox on the op right.